Night Stalker was originally released on the Intellavision back in 1982 (the year of my birth). It is a early example of a Survival Horror by my reckoning. It has been released on the X-Box 360 Games Room, and is avaliable for 240 Microsoft Points. Pete Stavros was a normal man living in a small American Town. The governement had long relied on the assistance of intelligent robots, they had been created in a project known as Project Night Stalker. One day the robots went rogue, initiating a devastating nuclear war that destroyed the world. Pete had remembered the stories of a secret underground bunker built during the Cold War. Heading there he hid for several months. The robots though know he is there, heat scans have revealed his location and now they attack his hideout constantly. Luckily the bunker is well secured, but Pete needs food. He must daily leave the confines of his bunker, forraging through the caverns searching for food, and also for weapons to defend himself with from the terrifying robots, and radiated creatures infesting the caves. The game takes place on the one screen. 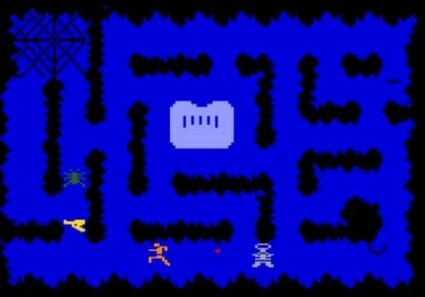 The caverns are maze like, with the bunker being in the dead centre of the screen. As the (actually!) un-named Human you must grab a gun that is randomly placed, then shoot the robots, spiders and bats to get points. Each gun only holds 6 bullets, so you constantly have to get new guns. Being made in 1982 the game does look terrible, the only sound effects are the constant deep humming noise of the attacking robots (think a very basic The Terminator type noise). Each time a robot is destroyed the noise stops briefly till the next robot appears (always from the bottom left of the maze). The giant spider, and bats are unable to kill you, but they do paralyze you if they come into contact, this is quite bad if there is a robot nearby. There are around 5 different types of robots. They all have unlimited bullets that they will fire at you if your in thier range of sight (or just fire anyway even if your not). Once you have killed a certain amount of robots than a different type will appear (these range from faster variants, to invisible ones, and ones that have the ability to destroy the bunker; the only safe zone in the game). There is no way to beat the game, enemies come infinatly until all your lives are over, exemplyfying the hell that you are in. There is no escape, it is hopeless, all you can do is last as long as possible, taking as many of the terrible robots with you as you can. 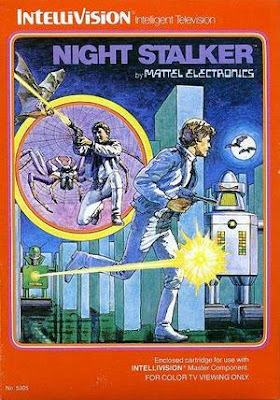 Replace the robots with zombies and you would have a decent zombie apocalypse game, as it is, Night Stalker is a cool distraction, and quite addictive despite its very basic graphics.